2019 Update: A lot has changed in the 3 years since I wrote this article, so I’m condensing this intro. Originally this was an article about how YouTube deleted two of my popular videos and my publisher dragged their heels. But through periodic updates, this article now focuses less on my story and more on the stories of other YouTube content creators. This article is arranged in three major sections. First are three examples of big-name YouTube videographers who had their videos deleted or falsely copyright-stricken by YouTube. Second is an evergreen list of many, many more videographers caught in the system. Finally, the story of how my own YouTube videos were deleted and the Kafkaesque reinstantiation process I went through. I urge anyone at YouTube reading this to improve YouTube’s policies so that videographers feel empowered to make legal, non-copyright-infringing videos without the looming fear of their channel being deleted without recourse. Google deletes YouTube videos and partner channels. Google deletes YouTube content that receive copyright takedown notices, without checking to see if the notices are legitimate, and they do it often. The following case studies will reveal some of the damage YouTube has done to its community of creators through their unjust removal of video content. The case studies will also illustrate the inadequacy of YouTube’s copyright claim system and customer support. It’s gotten so bad that Google has even taken down their own YouTube videos due to clearly fraudulent copyright claims. I wish I were joking. Please join me as we look at all of the content creators that have had their YouTube videos deleted. If I wasn’t able to cause such a loud noise about this, my channel would have remained suspended. If this happened to me a year and a half ago when my channel was tiny, I would have been done. But I had to waste my time, actively go out of my way in a cry for help to save my portfolio of work I’ve been building for years. For what it’s worth, at one point he had one of his videos taken down due to a false copyright claim too. 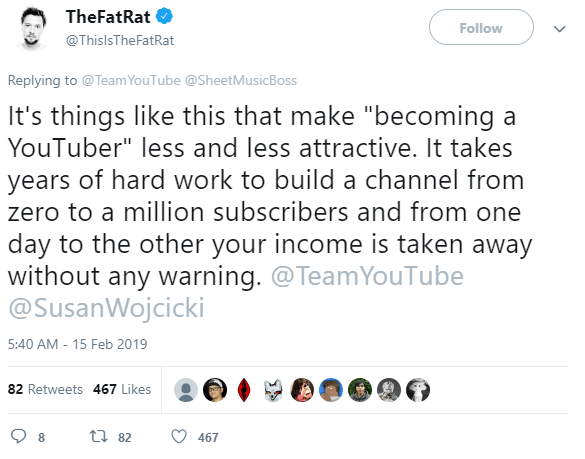 EDIT: His YouTube channel was suspended again in 2017 for Terms of Service violation. He appealed, Google reviewed his channel again and the suspension was upheld. After he shouted out for help on his Twitter, YouTube finally decided that “after a review of your account, we have confirmed that your YouTube account is not in violation of our Terms of Service” and his account was reinstated. On January 5, 2016, Doug Walker, more commonly known online as “The Nostalgia Crigic”, received an email from YouTube that monetization had been disabled for his account due to a copyright strike from Studio Ghibli. The copyright strike was levied against his video review of the movie “My Neighbor Totoro”, which is non-copyright-infringing under United States Fair Use law. Monetization is a privilege on YouTube that allows a video creator to receive a portion of the revenue YouTube generates by running ads on their video. By disabling monetization on Doug Walker’s channel, it meant that Doug was no longer making money from his full-time job of producing online entertainment. Doug Walker qualifies for YouTube email support because his channel is watched an average of over 160 viewer-hours per day (15k hours per 90 days). So he emailed YouTube to ask why this copyright strike disabled his entire channel’s monetization privilege, when previous copyright strikes had only affected the video containing the alleged copyright infringement. After contacting support on January 5th (support claims that they respond within 24 hours), Doug Walker waited 3 weeks for a response, all the while not making any money from his entire YouTube channel. Finally on January 28th, he posted a video titled “What The Hell YouTube” where he shared that YouTube was not responding to his support request and that they had cut off his revenue stream. Within 4 hours after Doug aired his video “What The Hell YouTube”, YouTube decided to restore monetization on his channel. Any channel can still be hit. It doesn’t matter what size. They can have their monetization taken away, they can be suspended, they can have their whole entire channel deleted, and you don’t have to be given a reason. This is still going on. With so many people that have come out before us and after us and the more attention we are getting to the people who are being treated unfairly with this process, we really don’t want to see this as “Well, we’re done, that’s the end of that.” We very much want to see this as the start. The start of some sort of big change going on, the start of dialogue, the start of changing these problems, getting them fixed. […] We did lose a good chunk of money but we’re going to be okay. TotalBiscuit’s case also sets the scary precedent that game developers are allowed to delete unfavorable reviews of their games from YouTube, while leaving up the favorable ones to be viewed. In light of all the recent channel and video deletions, I’ve added a reverse chronological list of the new damage that Google’s machine “learning”, lack of staff oversight, and disorganized customer service are causing. I only detail the biggest and most clear-cut cases here, so if you want more of a “full-blast” stream of this stuff on the daily, visit YouTube Compendium on Reddit. 3/27/2019: The developer of the game Cytoid writes a formal DMCA counter-notice to get his community-driven game reinstated on the Android app store. Upon receiving the DMCA counter-notice, Google notifies him that they will not be acting on it, and his game will still stay removed. KDE Connect has been removed from @GooglePlay for violating their new policy on apps that access SMS. The policy has an explicit exception for companion apps (like KDE Connect), but it was removed anyway and *there’s no way to talk to Google*. Google only provides one-way forms to contact them. I’ve filled the forms regarding this policy change … but never got an explanation to why KDE Connect doesn’t qualify as a companion app. There is simply no way to talk to a human being at Google. I bet this saves a lot in customer support. 3/1/2019: VICE Media deletes a gaming YouTube channel named Vice using YouTube’s internal tooling. The channel owner was given no notice, and there was no cease and desist letter or legal involvement. 2/15/2019: Sheet Music Boss, a piano tutorial channel, is demonetized for “repetitious content” with no way for appeal. 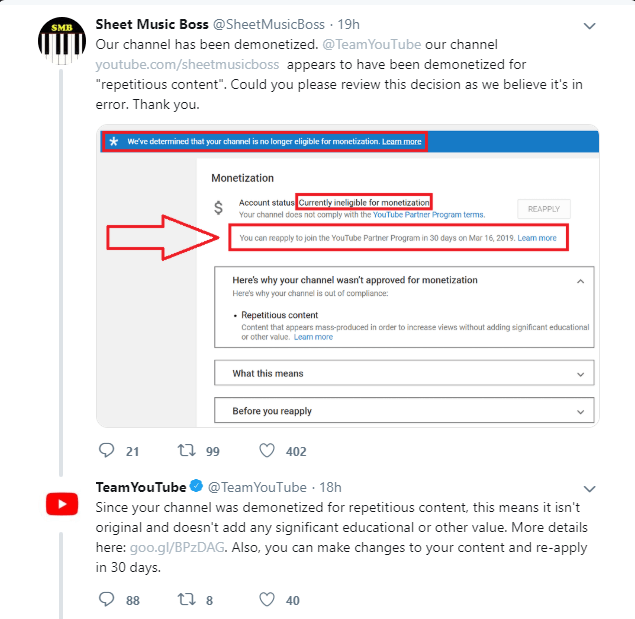 Upon tweeting at YouTube support, they received a response confirming the decision and suggesting they can “make changes … and re-apply in 30 days.” YouTuber TheFatRat (who also had issues with YouTube’s automated system), joins the Twitter thread. After gaining massive community support on Twitter and on Reddit, YouTube reversed their decision and re-enabled monetization on their channel. Sheet Music Boss has been demonetized. Edit: YouTuber Kenzo is extorted by the same company, who demands $400 in Bitcoin or $600 by PayPal. 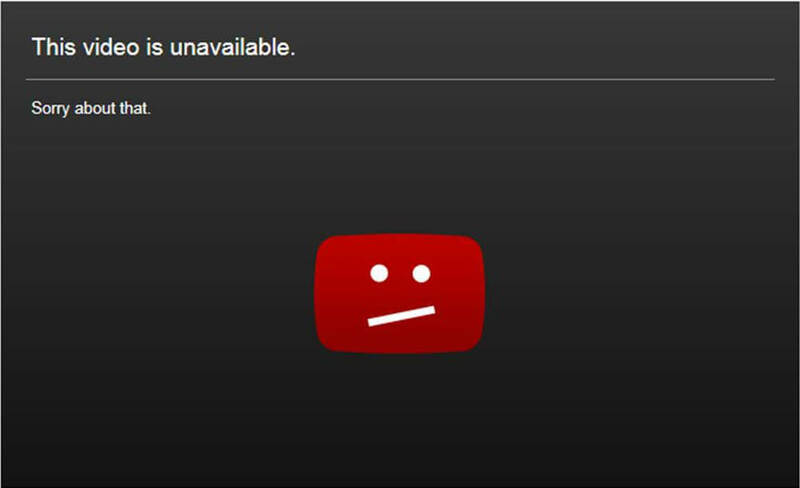 Like ObbyRaidz, if the company levies a third copyright strike then his channel will be deleted by YouTube’s automated system. 1/9/2019: YouTube allows CD Baby to claim the copyright of some guy’s video where he talks into his microphone to test it for 30 seconds. 1/8/2019: YouTube allows Lionsgate films to claim ownership of their film critics’ reviews, taking their revenue. 12/21/2018: Music artist TheFatRat’s original music with 47 million views is erroneously copyright claimed on YouTube. Youtube says that “they do not mediate copyright disputes”, and as long as the claimant continues to claim the music, the music video belongs to them on YouTube, full stop. TheFatRat is bringing in legal help to reclaim ownership of his music video. He also has a petition with about 100,000 supporters. 12/17/2018: Gus Johnson gets a copyright claim on his YouTube channel for discussing Bohemian Rhapsody. He didn’t play the song, he didn’t cover cover the song, and he didn’t use any snippets of the song in his video. According to YouTube’s copyright system, videos of people discussing Bohemian Rhapsody are the sole property of Bohemian Rhapsody’s record label. 12/6/2018: Google falsely tells Redditor sbruler that his warranty is expired. sbruler provides proof of his phone purchase and warranty information. After 5 months and 70 emails back and forth with Google Support, including one email where they say they fixed the issue and his phone should be recognized as under warranty, Google still does not recognize his warranty and his phone is still not repaired. 11/29/2018: YouTube channel Inside A Mind explains how the EU’s Article 13 could force YouTube to tighten up their Content ID system even further, and remove an increasing number of non-copyright-infringing videos that contain copyrighted content used under Fair Use. He explains: “You’ve got to remember that YouTube’s Content ID system is a form of AI and it cannot detect the difference between Fair Use and copyrighted material.” Thus, YouTube’s algorithm will always flag a number of legal videos in its attempts to remove illegal videos. 11/25/2018: Reddit user slipperygibbrish sends his Google Pixel phone in for repair. Google signs for the delivery, but then say that they never received it. Chat, phone, and forum support do not offer any solutions for him. 6/20/2018: YouTube blocks MIT’s college course content and the non-profit Blender Foundation’s instructional video channel.The Blender Foundation is considering using PeerTube to distribute their content so that their videos will not be erroneously blocked in the future. Curt Newton, the MIT OpenCourseWare director, states that their team is “quite frustrated by” the random YouTube block. 5/23/2018: (NSFW language) YouTuber Alinity copyright-strikes YouTuber PewDiePie for the reason that he called her friend a “thot”. When Alinity found out, she said on-stream “I’m gonna copy-strike this guy just for that word.” One of Alinity’s revenue streams is from disputing copyright on YouTube, as she explains: “A company that’s called Collab, they’re sending me $700 last month from copy-strike hitting people. Good money.” PewDiePie was lucky because he is one of the most popular channels on YouTube, affording him a direct line with YouTube support, so he was able to get the strike removed. Less popular channels are not as fortunate, and are vulnerable to copyright strikes like this that are filed in bad faith. 5/22/2018: Yet another Reddit user is ripped off (this time for $122) by Google’s phone trade-in “customer service”. After 6 weeks of interacting with customer support in many separate emails and calls, Reddit user /u/trickinit is still at a complete loss as to how to get his money back. 5/9/2018: Chemist NurdRage receives a community guidelines strike for synthesizing Pyramethamine, an antiparasitic compound, from household materials. YouTube doesn’t cite any reason in particular. 4/21/2018: YouTube demonetizes videos on science education channel Kurzgesagt, erroneously labeling its videos as “adult”. 3/16/2018: Google permanently suspends Reddit user DapperJet’s Google account payment privileges. He had purchased a Google Pixel phone and then returned it, but Google never refunded his payment, so he did a credit chargeback to avoid interest and late fees on his credit card. Google support apologized on Reddit, explaining that they were having a systems issue with phone returns and that he was banned in error, and assured him that his account would be reinstated and his refund would be applied. Two months later his refund is still not applied, his Google payment account is banned again, and Google is fighting his credit card chargeback. 3/1/2018: YouTube removes conspiracy theorist and gun-related channels, despite YouTube itself admitting that they don’t breach the YouTube community guidelines. YouTube’s response: “As we work to hire rapidly and ramp up our policy enforcement teams throughout 2018, newer members may misapply some of our policies resulting in mistaken removals”. Youtube disabled my Livestream channel! Help! 11/26/2017: DisguisedToast, a video game streamer, had his second YouTube channel banned for “impersonating” himself. Upon manual review of his appeal, YouTube determined that he was still pretending to be himself, and refused to reinstate his account. 11/16/2017: Google’s spam algorithm deletes their very own Chromebook advertisement video for being “spam, deceptive practice or scam”. This is not the first time that Google’s spam algorithm has automatically removed their own YouTube videos. I'm Back! But from what? 10/8/2017: YouTube reveals their policy on demonetizing videos discussing tragedies. Casey Neistat’s video is demonetized; similar videos by large publishers are not. 8/22/2017: Reddit user syedghasan’s main Google account of 10 years is deleted for “violating terms of service”, though he is not able to find any way that he violated ToS. Google support says that they are not “able to discuss the specific circumstances of this or any suspensions”. Last video? YT may shut me down. I need your HELP. YouTubers Union: On The Road To Victory? 1/1/2017: Google begins deleting Instalok’s fair-use YouTube music parodies. Instalok Update: "Our Situation and Copyright Problem Explained"
DIDN'T PAY $1000 OUR CHANNEL GOT TERMINATED! 10/21/2016: Google deletes YouTube user DoctorGTA’s parody video about the Samsung Galaxy Note 7 and revokes his live streaming privileges due to a copyright claim by Samsung. As many users from Hacker News point out, there is no legitimate basis for the copyright claim whatsoever. 9/9/2016: Google deletes developer Zeno Popovici’s Chrome extension. Google does not cite any specific trademark violation, and says that there is nothing they nor the developer can do unless the 3rd party retracts their infringement complaint. 7/15/2016: Google deletes artist Dennis Cooper’s blog and his primary Gmail address, along with a decade of his artwork. Google gives no reason for why they deleted it, and does not allow any appeal of their decision. 5/25/2016: Ethan and Hila received a copyright claim and are now being sued by Matt Hoss for a video that is very obviously fair use. As a result of receiving the false copyright claim, YouTube suspended their account. In the comments on Ethan and Hila’s video, Charles Walton chimes in saying that his money is being stolen due to a false copyright claim on his video of a gorilla at the zoo. In the Reddit comments, user TheSystem_IsDown writes that a record label has applied a copyright infringement notice to his video containing nothing but the Shephard Tone, an acoustical illusion that is not copyrightable. YouTube has allowed the record label to steal hundreds of dollars in video profits so far. These are just some of the channels that have won the fight to regain control of their content. Many channels, especially the smaller ones, have not been so lucky and have lost their content and sometimes their entire YouTube channels. In all of these cases YouTube’s automated emails are unapologetic, and YouTube’s customer support is nonexistant. In the next section I will talk about how Google removed my videos due to what they believed was a ToS breach. Since Google didn’t care to let me speak with them, I will argue here instead that I never broke the YouTube Terms of Service that I agreed to, and that Google deleted my videos unfairly. Google removed my YouTube videos too. Before we dive into the story, I would like to fill you in with a brief background of my YouTube video career. 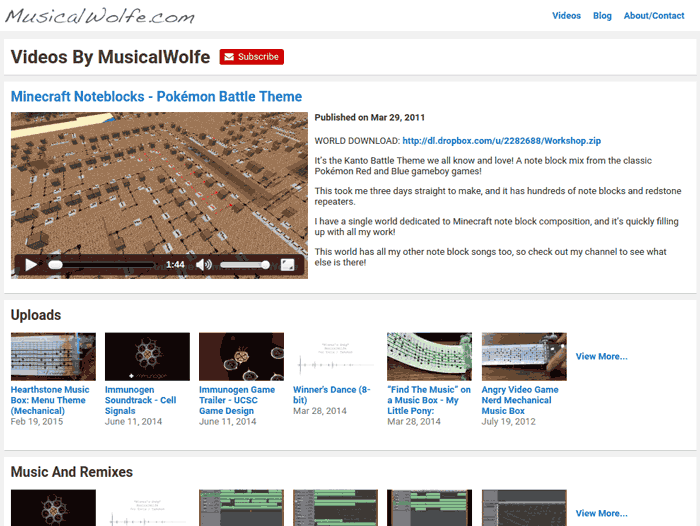 Right around Christmas 2010 I began a YouTube channel called “MusicalWolfe”, and began uploading music that I created. It was virtual orchestrated music, so I would use virtual instruments like pianos, violins, horns, and stuff to create some neat music. Some time in 2011, Notch (the lead developer for the popular game Minecraft) released a method of making music in Minecraft using a new feature called “Note Blocks”, so I started posting some of my Minecraft “Note Block Songs”. They became more popular than I could ever imagine, and so I started doing popular tunes like the Pokemon Battle Theme, the credits song from the game Portal 2, the Star Wars opening theme, and more, all created in Minecraft. I had found a niche on YouTube that I was good at. I kept on posting Minecraft videos, and by June 2011 I had reached my 1 millionth view. Soon afterwards the video firm Machinima, Inc. came forward and offered me a partnership deal so I could begin making money from my YouTube videos. I signed a 2-year contract with them and kept producing content. I was in my first year of college, and on YouTube I had some fans and was making decent money! This would continue for a few years while Minecraft music was fresh, popular and exciting. Misleading descriptions, tags, titles, or thumbnails designed to increase views are not allowed. Tags should only be placed in the appropriate tag section and not in the description. It’s also not okay to post large amounts of untargeted, unwanted, or repetitive content, including comments and private messages. You can watch this video to learn more about our policy and how to appeal this decision. I checked the video and it had roughly 700k views before its deletion. A few minutes afterwards, a second one of my videos was deleted (one of my songs with about 150k views). It didn’t take me long to figure out that both deletions were due to the use of keywords in my video descriptions, which has been a common practice since 2005. There was no guideline I remembered that said this was against the rules. It turns out that I was correct - Google added the guideline against using keywords in descriptions in 2014, then in 2015 they decided to enforce that rule, and they reached back and removed two of my videos from 2011 with nearly 1 million combined views. Keep in mind that all keywords I used were relevant, I wasn’t trying to steal traffic by including bogus tags. My Portal 2 Minecraft Note Block video had keywords like “MusicalWolfe, Musical Wolf, Portal 2, Minecraft, Note Blocks, Noteblocks, Song”, so I wasn’t doing anything misleading (“MusicalWolfe” is my channel name). My channel is partnered through a company called Machinima, Inc, which theoretically offers some benefits over being partnered directly with YouTube, and one of those is a staff to bounce ideas off of and get support for my YouTube channel. I started out by looking through Machinima’s Knowledge Base and realized I was not the only one with their videos being taken down due to the once-common practice of using keywords in video descriptions. YouTube’s New Metadata Policy: How To Avoid Having Your Videos Removed! Metadata refers to any and all additional information provided on a video. This includes the title, description, tags, annotations, and thumbnail. The reason we have metadata is so that you can add additional contextual information to your videos. Please do not use these features to game or trick our search algorithms. All metadata should be representative of the content contained in your video. Among other things, metadata added in an attempt to game search algorithms will lead to the removal of your video and a strike against your account. Please select a reasonable number of tags that most closely reflect your video content. Please also only add tags to the tag section of your metadata. Adding additional tags to the description of your video may constitute spam and can result in the removal of your video. What this means for you as a creator is that if your video’s metadata does not comply with their policy, it can be removed. You may be eligible to appeal for it to be reinstated, but wouldn’t it be better to avoid having it taken down in the first place? In order to do that you’ll have to edit your video’s description to remove any tags you may have included. This was once a common YouTube practice but is no longer allowed. If you have a large number of videos and you’d like to edit all the descriptions at once, please follow the instructions in the PDF below. Should any of your videos get removed for this reason, please follow the instructions here to appeal the decision. The most important part of this KB article is “This was once a common YouTube practice but is no longer allowed.” What that means is that Machinima is aware that YouTube changed their ToS to make a commonly used white-hat SEO practice against the rules, and that many YouTube partners are finding their old videos deleted for violating the new rules. The most obvious way to get a video reinstated (and what Machinima’s article recommended) is to file a takedown appeal, so that’s what I did. A few days after I received the video takedown notice, I submitted appeals for both videos. I was prepared to wait a while for YouTube to sort it out (I was expecting several weeks). I was prepared for a “Yes, your videos are reinstated” response, and I was also prepared for a “Sorry, your videos will not be reinstated” response. I was not prepared for the process to fail entirely. Two of my videos were removed from YouTube on May 28 because Google believed they violated community guidelines. I began the appeals process on one of them shortly thereafter, and it’s been 3 weeks with no update on whether it has been approved or denied. From what I’ve read online, the appeals process usually takes 2 weeks at most. How can I check whether my appeals have been approved or denied? Among the responses, one user said 7-10 business days was the norm for a video appeal response, but some reviews have taken “much longer”. Another user pointed out a section of the YouTube Creator Playbook on Page 41 that said “Adding additional tags to the description of your video constitutes spam and may result in the removal of your video”. I didn’t add any additional tags to my video description though - I only added the ones that were already attached to the tags section of the video, and furthermore all the tags were relevant to the video. After a few back-and-forth replies on the forum I realized that I wasn’t going to get any clean answers and there would be no way to talk with a YouTube support agent, so I ended up abandoning the thread. I suspect that the videos were removed because the community guidelines were changed recently to disallow the use of relevant tags in the video description, and the old video descriptions didn’t satisfy the new guidelines. In any case, I filed appeals for both takedowns in May 2015. I read online that YouTube can take a long time to confirm or reject appeals, but it’s been 5 months and the appeals have neither been confirmed nor rejected. In any case, it’s not okay for YouTube to just remove my high-view-count videos from 4 years ago without giving me any chance to make it right. How can I get these almost 1 million views back on my channel? I am doing my best to follow the YouTube ToS, and I’m not willing to accept that they are just gone permanently due to me not paying good enough attention to YouTube’s ToS changes over the years. One would think that since I am a paying customer (50% of my ad revenue) that YouTube would be able to provide email/phone support, but I can’t find any way to contact them. How can I get a real human at YouTube to review my situation and realize that my videos aren’t spam? YouTube recently revised their policies regarding metadata (titles, tags and descriptions). Thank you very much for that link - it’s good to know I’m not the only one! According to the appeals form, YouTube was supposed to email me with their decision on my appeals. Because it’s been five months now since the appeals, and to the best of my knowledge the appeals haven’t been approved nor rejected, how can I get YouTube to finally make a decision? If you already appealed those videos, you have to wait for YouTube to revise it and approve it (if approved). As an advice, avoid to appeal more than once as it may affect the process, YouTube has been very strick lately about this matter. For now, what it’s left to do is wait for an e-mail from YouTube. Got it. YouTube just takes a long time to respond to their appeals. So I waited a while longer. My videos have been gone for 8 months, not showing up on the internet and not making any revenue. I decide to contact Machinima again, as to me, 8 months with no response means that there is zero chance YouTube is still working on my appeal. It’s been 8 months now and no response from Google whatsoever to my appeals on these 2 videos. I am really frustrated and I am legitimately considering deleting my YouTube account and moving to Vimeo, where they won’t randomly delete my videos. I can’t keep making YouTube videos if there’s a chance they will be removed without any recourse. What can I do from here? Unfortunately if YouTube believe that his monetization program is being affected, they will delete the videos without any warnings, but they should not take too long to respond. Thank you Carlos, but what I’m asking is how do I get YouTube to respond to my appeal instead of continuing to ignore it? As you know, YouTube has no way of contacting them directly for support. Machinima has direct ties to YouTube, so I was hoping you would be able to find someone who can get YouTube to provide some response to this situation, or to finally review my appeal. I’ve paid a lot of money to Machinima over the years in the form of ad commissions, and I feel like this is the only time I’ve really needed you guys for help. I would appreciate it if you escalated this case to someone at Machinima who is in direct contact with YouTube. This seems like it would be a relatively simple issue to solve as soon as anyone gets the attention of a live person at YouTube. Help with navigating the YouTube bureaucracy was the reason I signed up with Machinima in the first place, so if you guys can no longer help with that then I feel like there is not really any reason for my YouTube channel to be partnered with Machinima anymore. I have been waiting a very long time, and I am ready for something to happen. At this point Carlos closed my ticket as “solved”. Okay, how do I get YouTube to deal with me directly? Carlos closes my ticket and marks it as solved. Thank you Carlos, but it’s been 8 months since I submitted my appeal to YouTube and I have gotten no response from them whatsoever, so there is no reason to believe that a response is forthcoming. I have already followed all of the steps in the article that you linked. That is why I am now reaching out to Machinima Support to help get me in contact with someone at YouTube who can review my appeal and provide some sort of response. Opening this line of communication shouldn’t be very hard for someone working at Machinima to do. I can’t quite believe that there is nobody at Machinima who can help me with this issue, because I know that some of Machinima’s employees are in direct contact with YouTube, and it is Machinima’s job to be the go-between for its partner channels and YouTube. I would like to get a second opinion from a higher tier of support. If they also cannot help me get in contact with YouTube or adequately explain why they are unable to, I will consider cancelling my Machinima partnership. Please contact us 6 months (or less) before the end of your current term to discuss contract options. At this point it seems clear that Machinima is not willing to contact YouTube on my behalf, so I begin discussing the cancellation of my contract. Thank you Carlos - I forgot about the contract. As it turns out it expired years ago, so it shouldn’t get in our way. I would like to unlink my YouTube account from Machinima now, because I’m not ready to sign a new contract. Can you please help me with that? Thank you for letting us know you’d like to discuss the terms of your contract. We have taken note of your request and a representative from our contract department will contact you soon. My name is Madeline, nice to e-meet you! I work in Machinima’s retention department. Thank you for being one of our awesome partners! I can help you with any concerns regarding your contract with us. You’ve been on a (REDACTED) contract for quite some time. I’d like to help transition you to (REDACTED) for a 2-year term, effective March 1, 2016! Attached please find a copy of our network benefits. Please let us know your thoughts on this. Thank you! The reason I am quitting Machinima is that Machinima is unable to help me solve a problem I ran into that makes it so that my future YouTube videos are liable to be deleted. In 2015 YouTube deleted two of my videos from 2011 for “misleading metadata” (though I never edited the metadata since they were uploaded), erasing about 900,000 views from my channel, and when I filed an appeal it was completely ignored for 9 months (neither accepted nor rejected). I can’t make new videos knowing that my old videos may get deleted after 4 years, lots of views, and new YouTube policy changes. YouTube provides no way to contact them, so I asked Carlos from Machinima to help me get in contact with someone from YouTube so that they would be able to finally either accept or reject my video appeals. Carlos assured me that Machinima is unable to “assist, negotiate, or tell” YouTube anything about reviewing my appeal. We talked about this issue on Zendesk in support ticket numbers 147424, 151775, 152385, 152429, 152670, 152790, and 153422. Carlos was adamant that nobody at Machinima could help me with this issue, and furthermore that nobody there could get me in contact with a representative at YouTube, basically that my videos are gone permanently and I am completely out of luck. Maybe you have a different take on the issue though? If we can get this resolved, I would like to discuss renewing my Machinima contract. Otherwise there is not much point in posting on YouTube anymore. (Mar 7, 2016): Madeline says she’s looking for answers and to stay tuned. Just following up, we have reached out to a representative at YouTube to find out more information and to see if we can restore the videos. I reply and thank her for the follow up. Great news - heard back from our YouTube representative and the videos have been reinstated! Feel free to reach out if you have any questions! Also, let me know if you are ready to resume the conversation regarding your contract. Success! My videos are finally back up! It’s been 10 months and my videos are finally back, with no thanks to Google or their support, but with help from Machinima’s retention department after I threaten to cancel my contract. I immediately edit my video descriptions to make them compliant with YouTube’s new ToS. The rest of the conversation between me and Madeline is about a future Machinima contract, which I understand is retention’s job, but it’s not something I’m quite as enthusiastic about. Since I was only able to get support from Machinima’s retention department last time when I needed it (thank you again for the help by the way! ), I am hesitant to sign a new contract that has a minimum term. Also, I am considering changing up my online brand strategy considerably sometime within the next few months, which may have a potentially large effect on my YouTube channel, so I would appreciate the time to wait and see what happens. If at that time I do choose to continue with Machinima, what RPM (revenue per thousand views) will I generally be able to expect? (Apr 4, 2016): Madeline emails me some information about the payment model for new Machinima contracts, and offers me a new 1-year contract. Madeline, I want to thank you again for your work in getting my videos reinstated. I can’t commit to signing a new contract at the current moment, but I will contact you with my decision soon. Now I get to decide what to do with my YouTube channel. Should I just keep uploading content and hope that I never need to contact the nonexistant YouTube support or the disorganized Machinima support again? It’s likely a risk I have to take if I want to keep earning money for my videos online. But I have always been one to do something differently when things aren’t working well, plus I feel like at this point I would prefer the closure of withdrawing Google’s license to use my video content. I could always move my channel to Vimeo and pony up $60/year to have them host my video (I hear they have customer support issues as well, but at least they have an email contact). But instead, I am going to try an experiment. I’m usually better at programming when I’m up against a challenging circumstance, so I started developing an open source project called OwnVideo that lets web developers host their own video pages on their own website. OwnVideo is a Jekyll static site generator theme that lets you host your own videos on your own website. What this means is that you become your own video provider. It includes a video transcode script that lets your users watch your videos in a multitude of resolutions. It lets users subscribe by email to get notified when you post new videos. It includes social network sharing and full playlist support, and through Disqus, it allows users to like and comment on the videos. It lets you host your video content on server separate from the site’s code, so you can pick your favorite bandwidth provider like Amazon S3, Google Cloud Storage, etc. to host your videos for you (and if you end up not liking your provider you can change seamlessly with no downtime). I believe that OwnVideo is an important experiment in letting users retake control of their video content and in helping make the internet more decentralized, as it was originally designed. It’s my intent that if OwnVideo is successful, its open source code can be extended to create something more user-friendly so that anybody can host their own video online even if they are not a web developer. Using my open source OwnVideo software, I plan to move all of my videos from YouTube to MusicalWolfe.com, effectively migrating my channel off of YouTube. I will make a post on my YouTube channel that informs my subscribers that my channel is moving, link to this article so they know why, and link to the new channel location at MusicalWolfe.com so they know where it went. I will mark all of my current YouTube videos as Unlisted, so they will no longer show up in search, no longer contribute revenue to YouTube, and so my new channel will have some semblance of a chance at SEO. I am choosing to mark as unlisted rather than private or deleted, because this means that existing video links and embeds on the internet won’t break. I will be curious to see how many users follow this transition, and how many of them choose not to venture beyond YouTube. Edit 4-29-2018: Less than 5% of my viewers decided to follow me onto my own site. I’ve decided to switch back to YouTube but with monetization disabled. Read more here. I know that by closing my partner channel and migrating my videos off of YouTube I will be losing a whole lot of benefits. I will lose being able to share my videos for free, and instead I will be paying for hosting. I will lose the traffic that YouTube gives my videos via their Suggested Videos sidebar along the right hand side of every video. I will lose YouTube’s rock-solid adaptive video delivery network that eliminates video buffering on even very slow connections. I will lose YouTube’s AdSense ads that earned me enough money to replace my side job during high school and college (I can’t use AdSense in good faith on the new site, though if it gets some traffic I’ll look into alternative ad providers). At this point it’s less about getting as many people possible to see my videos (though I hope many of them will follow me to my new channel! ), and more about sending a message that YouTube’s current state is unacceptable, and that even though they have a monopoly on monetized online video, that doesn’t mean that they can delete my videos, ignore my attempts to contact them, and expect me to continue using their service. Many content creators don’t have the opportunity to switch from YouTube to a different video host, but I do and it feels great to take it. I’m looking forward to overcoming the technical hurdles of hosting my own video site. If you are curious about what kinds of videos I make, I’ll be hanging out at my own self-hosted video channel at MusicalWolfe.com. Subscribe to my future articles!